The Writers Alley: Day After Thanksgiving-- Alleycat Style! Day After Thanksgiving-- Alleycat Style! Today, we alleycats would like to share what WE are thankful for in our writing life. "I'm thankful for God moving in my life at ACFW. It took a trip I wasn't looking forward to and made it one of the best spiritual experiences thus far of my life." "I'm thankful for what I've been learning about building my platform. This year my focus has shifted from writing to marketing. I've learned so much, culminating in my recent blog launch which has had an amazing response so far, with well over 400 shares on my first two posts. I couldn't have imagined such a groundswell of support. It's been touching and humbling, and I'm so grateful." "I'm so thankful God brought Amy to The Alley this year. She's been a fabulous addition to our group (as well as a wonderful friend) and I am constantly flooded with gratitude for two beautiful ladies who have been constant encouragements to me in my writing: Julie Gwinn and Beth Vogt. God's used them this year to kindle my heart with faith in my writing, even as a lot of tough stuff has happened. And of COURSE, every year....every DAY, I'm thankful God sent me the most fantastic group of ladies with which to share this writing journey. AlleyCats - you're amazing!" "I'm thankful that our worth isn't judged by book contracts or sales numbers or even how fast we write our books. I'm thankful that my worth, even as an author, is found in JESUS. I'm thankful that Jesus smiles at each word I write. I'm thankful for new visions He's given me for this upcoming year, and for allowing a passion for writing to flourish in my heart once again. And I'm thankful for readers. Every time I get an email or note about my book from a reader, my heart swells. That God is using my book to touch lives is so incredibly amazing." "I'm thankful that God is teaching me to dream bigger dreams and catch a vision that sees writing as a ministry and form of worship. I'm also thankful for health in my body after a very frustrating and exhausting period this year with a broken foot. You realize how much you value the everyday things whenever you suddenly can't do them. AND, I'm thankful for A Cup of Christmas Cheer, my first publication, and the amazing team at Guideposts I've been able to work with." "I would have to say that I am thankful for y'all's patience as I have taken a writing break and haven't really had that much to blog about at The Alley. This has been a difficult year, with many life altering experiences and some depression and "reclusiveness". I know I've been distant and not my chipper self, and yet you all have encouraged me and loved me anyway. So thank you all for your love and patience and accepting God's nudge for me to set my writing aside for a time. p.s. I am hoping this next year is the year to step back in. :)"
"I am thankful for God's grace and goodness. So many times I sit at the computer reading the chapter synopsis I preplanned and wonder what was I thinking? Something interrupts my work that inevitably provides the spark needed to fix the problem. Only God would take the time to give a nudge 'cause He loves us. Knowing my waco thought process, He had someone recommend my purchasing the Scrivener program. At last, I am organized and not floating in the abyss. For the first time, I finished a book in seven weeks from research to "The End". God has also blessed me with my treasured friends the Alley Cats and our retreats which rev the creative juices and lasso crazy ideas. Casey has yanked my brain out of the mud several times. Thanks, Casey. You have all fulfilled the need for kindred spirit in my life and I am thankful God invited me into this family. And our Alley Pals are a constant inspiration. Happy Thanksgiving and Blessings on you all." "I am so thankful to be a part of the Writer's Alley. Writing was such a lonely pursuit before you all came along and adopted me. With the wonderful blessing of this incredible group of encouragers, prayer warriors, and friends, came my amazing critique partner and sister of my heart, Pepper Basham, who has become one of my closest friends. Having a support group as a writer is something I am immensely grateful for. Every. Single. Day. I am also astounded by God's goodness in giving me such a rock-star agent and champion in Chip MacGregor. So grateful writing doesn't have to be a solitary adventure, and it's so much fun to be on the journey with each of you!" "I'm grateful for watching the ways God fulfills the visions He has for my writing life in His ways and His timing. For me right now, that meant opening the door for some freelancing. I'm finding it lots of fun! Also this year, God answered a prayer in a special way by helping me to find women who love the Lord and love to write in my own hometown. What a blessing! And of course, very thankful for my Alley Cat writer friends!" "I am thankful that God has used my writing struggles to help remind me that it really is ALL about Him. I am thankful that I'm celebrating my anniversary of signing a contract with my agent, Tamela! I am thankful for the new tradition of an AlleyCat retreat, and the deepening of friendships with my writer friends. I am also thankful for new stories yet to be written!" Awww, it puts a smile on m face too! 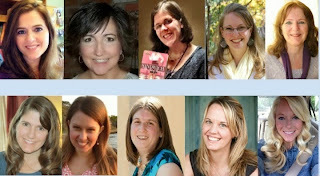 Each of you ladies has added to my writing life and encouraged me in some way. Thank you!